« AS I LAY DYING & WHITECHAPEL ON BILLBOARD TOP 200 ALBUM CHART! This entry was posted on June 30, 2010 at 12:06 am and is filed under classic rock, classic rock music, Hard Rock, hard rock bands, hard rock music, Heavy Metal, heavy metal albums, heavy metal bands, heavy metal music, metal odyssey, Music, rock music with tags 1980's hard rock music, 1980's heavy metal albums, 1980's heavy metal bands, 1980's heavy metal music, aor, assault attack album review, classic rock music, guitar legends, hard rock music, heavy metal guitarists, heavy metal history, heavy metal music, melodic rock music, metal odyssey, msg heavy metal band, Music, old school heavy metal, rock music, the michael schenker group heavy metal band. You can follow any responses to this entry through the RSS 2.0 feed. You can leave a response, or trackback from your own site. 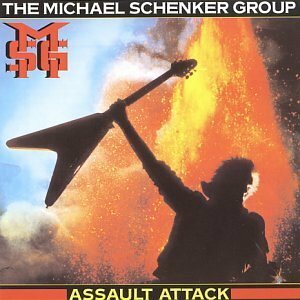 This is my favorite Michael Schenker Group album, this album rocks from beginning to end and his partnership with Graham Bonnett was inspired, too bad it was so short lived. Not a bad track on the album and it is album I need to upgrade from vinyl to CD. I must have listened to this album 1,000 of times, and while MSG has produced some fine albums after this, none better IMO. Well said! I “upgraded’ by buying the “album” on itunes… it was under 5 bucks too with the remastered bonus track included. “Girl From Uptown” is a real good song… it makes you wonder how many other cool MSG songs are kept in hiding all these years. You are a consummate reviewer – the reminiscence, the good ‘ol days references – very very well done. I’ll be at this site fequently from here on out. And – I think it’s damn relevant, as you’ve put it – that songs like this would fit in to a present-day rotation easily. Michael is revered as not just the melodic soloist, as I’m certain you know – his compositions (those solos are definitely compositions in their own right) just convey SO MUCH emotion, and as you said – they always FIT… they punctuate, they underline and they exclaim the emotion and meaning within the larger song; his rhythm work the foundations secured in bedrock.. there was only ONE Michael, and a million Eddies. I appreciate seeing that folks such as yourself – get it – and you write about it, chronicle this stuff for others to learn a bit about those days, and the relevance of heroes like Michael. Cheers mate. I wish I had mentioned just how good, technically, Michael was – melodic but also playing difficult and complex licks and inventions; and your reference to Joe Satriani is very relevant. I have no doubt that Joe was influenced by Michael – I hear it quite often in Joe’s material, especially the first few albums. I’m pretty sure Joe has mentioned it – and have no doubt that he would credit Michael as I do (for that matter, I have to credit Joe for my “graduate studies” so-to-speak, lol). Again – this is an extremely professional review. Kudos to the writer.